The Ritual, adapted by Joe Barton from Adam Nevill’s 2011 bestseller, is now a feature film directed by David Bruckner (who aficionados may remember contributed ‘Amateur Night’ to the anthology horror film V/H/S). The story concerns a group of old college friends, Luke (Rafe Spall), Hutch (Rob James-Collier) Phil (Arsher Ali), Dom (Sam Troughton) and Robert (Paul Reid) who are planning their annual holiday together. Luke and Robert enter a late-night convenience store when a brutal robbery occurs, leaving Robert dying in a pool of blood on the floor, while Luke cringingly watches from a hiding place. Although out of their usual comfort zone, the rest of the group decide, as a tribute to their dead friend Robert, to take up his suggestion of a hiking weekend in the hills of Sweden. The trip has a glum, penitential atmosphere, where everyone is on edge, coping with their grief over the loss of good-guy Robert, while trying to avoid thinking about Luke’s part in his death. Despite their best intentions to pay tribute to their friend’s wishes, some of these guys are in poor shape to undertake a demanding cross-country hike and inevitably an accident occurs, in this case a twisted knee, and they are required to find a more direct route to the next town. This would entail a detour through a thick and ancient forest. Now, if there’s one thing that horror movies have taught us, it’s that no good will come of cutting through the dark, spooky woods – it’s a horror trope, dammit! So, of course, these lads head off-trail and stumble across some pretty gruesome indications that perhaps their so-called short-cut might not have been the best option. Things only get worse when they are forced to seek night-time refuge from the elements in an abandoned cabin, festooned with runic signs and tokens. Inevitably, sinister things begin to happen. The cabin contains some kind of shrine which causes hallucinations, night-terrors and lucid dreams. The men awake from their vivid nightmares in odd, disturbing situations, and Luke in particular, finds he has been marked with an odd wound, after experiencing surreal hallucinations relating to the violence he witnessed in the convenience-store. Night-terrors occur whenever the guys go to sleep, and they are hounded (and worse) by an unseen supernatural menace. There are obvious hints of The Blair Witch Project and Deliverance. There are jump scares aplenty, uncanny images, strange noises and movements in the trees, throw in a cult who worship an ancient Nordic ‘god’ with brutal rituals, and we have a perfectly fine horror-genre romp. 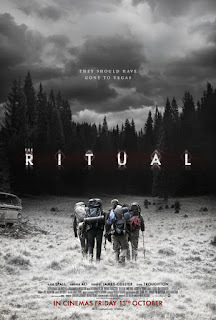 From the brutal opening robbery to the final nightmarish chase scenes, The Ritual offers some effective scenes and set pieces, with excellent cinematography from Andrew Shulkind, who creates a real feeling of grim claustrophobia. The gore is impactful without being nauseating. Ben Lovett’s score serves to increase the tension. The only problem may be that director Bruckner throws so much into the pot, that his homage to horror tropes never quite develops its own identity. The Ritual was certainly chilling at times, but the further we delve into the basic story the more disconnected one becomes. What might be seen to save the film is a deeper layer dealing with the themes of guilt, grief, redemption, friendship, and the crisis of masculinity. The Ritual implies that the primitive woods may be releasing repressed psychological manifestations of guilt and regret, but also might offer a mysterious form of atonement (Nevill’s book highlighted this aspect). In this sense Rafe Spall delivers a strong performance, conveying interior grief and trauma, the psychological horror of his nightmarish flashbacks, and in the violent denouement, grasping at a tenuous opportunity for redemption. Copyright R.H. Zelen – ©RenZelen 2017 All rights reserved.